Lexapro Weight Gain And Loss: How Does Escitalopram Affect Weight? Lexapro (Escitalopram) is a treatment for depression and anxiety. Like many other antidepressants, this drug can cause a person to lose or gain some pounds. Although usually, the patient returns to the pre-treatment weight once the treatment is stopped if these changes affect the patient’s well-being and self-esteem it would be for the best to address the concerns and seek advice from a doctor. Does Escitalopram Cause Weight Gain? Does Lexapro Cause Weight Loss? How Does Stopping Lexapro Affect Weight? Is It Safe To Use Lexapro Off-Label To Lose Or Gain Weight? How To Cope With Weight Change From Taking Lexapro? Lexapro is an SSRI, a group of medications that increase the level of serotonin in the brain. Serotonin is not only a chemical that regulates a person’s mood, but it also plays an essential role in controlling weight. This drug might work well in treating anxiety and depression, but it also comes with several side effects such as gaining some pounds. Why does Lexapro cause weight gain? As Lexapro lessens the effect of anxiety and depression, the person will begin to feel better and have an increased appetite, eating more, therefore gaining some pounds. According to the United States National Library of Medicine, one of the recognized side effects of the treatment is increased appetite. Although there are many theories that link escitalopram and weight gain both metabolism and appetite may be affected. Some patients do not eat more than they did before the treatment and still gain some pounds which means that their metabolism was influenced by the antidepressant. On the other hand, there are numerous patients who say that they saw a weight gain with Lexapro because the medication not only made them hungrier but also made them crave carbohydrates. Although none of the theories regarding Lexapro weight gain has been scientifically proven, many of them are accurate. Appetite change – during the treatment the patient starts feeling better noticing an increase in appetite. Carbohydrates cravings – carbs are linked to serotonin and as this drug increases the serotonin levels so does the craving for unhealthy foods such as pasta, artificial sweeteners, refined sugars, bread, chips, and crackers. Drug interaction – Lexapro could interact with other medication increasing the chance of the patient gaining some pounds. Hormone levels – there is a high possibility that during the treatment the patient’s cortisol hormone levels to increase, resulting in fat storage. Fat storage – if the patient is on medication for a longer period, the mechanism by which the body digests food and stores fat can be altered. This increases the chances for the fat to be stored in places such as the hips, chest or stomach. Laziness – some patients will experience a drop in the motivation and energy levels during the treatment. Although it is not the patient’s fault for lacking the energy to exercise, this could explain the weight gain. Slow metabolism – this dug is believed to cause changes in the metabolism, making it slower. With a slower metabolism, it will be much easier to put body fat on, even if the patient eats the same as before the treatment. Taste improves – some patients might notice that food starts tasting better while on medication. The drug is believed to change the neurochemistry, making some foods taste better than before. 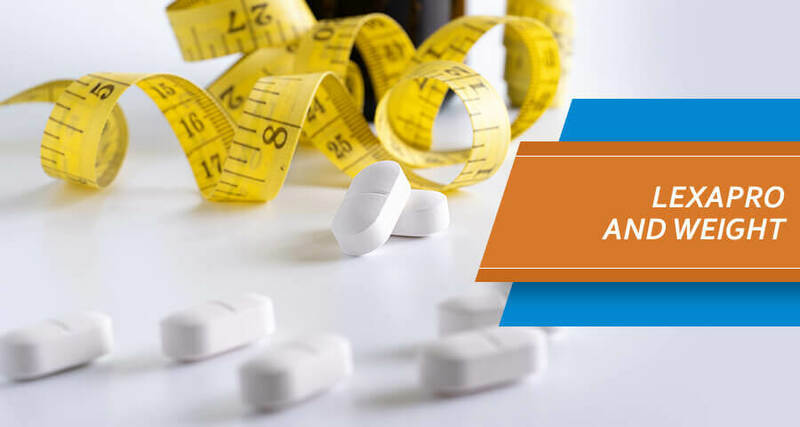 There are medical reports which say that losing some pounds is a typical effect during the first weeks of using escitalopram, but unfortunately, they are not well supported by research studies. It is believed that the link between escitalopram and weight loss is because the antidepressant reduces the body mass index and weight, but not the obsessive-compulsive symptoms such as binge-eating. There might be other explanations for Lexapro and weight loss. A patient might also lose weight that was excessively accumulated before the treatment. In other situations, the patient can see an initial weight decrease, but then a gradual gain as the treatment progresses. Sometimes weight changes could be sustained throughout the treatment, but can gradually fade away or even reverse. First of all, because the body is used with the medication, the patient should stop treatment gradually and not abruptly. It has been noted that Lexapro side effects in women and men do not stop immediately the treatment was ended. Since Lexapro and many antidepressants lead to physical dependence, the patient might experience escitalopram withdrawal symptoms when quitting the treatment. These symptoms include weight changes, such as adding pounds, losing them or both. Still, there are many patients who experienced weight loss after stopping Lexapro. Once Escitalopram is out of the body fatigue diminishes, and the patient can return to a normal habit of eating and exercising. For most patients, having a healthy diet and a vigorous workout schedule accelerates the weight loss. When discontinuing antidepressants, it is essential to talk to an experienced physician first. He will be able to create a plan to gradually taper the SSRI and help the body readjust to the change and get rid of the escitalopram weight gain. The patient can achieve weight loss after Lexapro with patience and the right diet and exercise plan. Medical specialists have already noted the possible Lexapro weight gain or loss effects and anyone reading a label or searching the internet has access to this information. Many believe that when diets fail, Lexapro weight loss might be the solution for their weight struggle. Some may turn to unconventional methods and use the antidepressant to aid in their weight loss or weight gain efforts without being aware of the danger they expose themselves to. People do not acquire all the information they need on Lexapro and weight, and the fact that the drug has dangerous side effects, such as Lexapro headache, insomnia, seizures, blurred vision, heart damage, increased blood pressure, fainting, hallucinations, tremor, and aggression. An experienced doctor can advise on the Lexapro uses and the danger of using it for other purposes. There are numerous drug addiction rehabs who treat people who abuse antidepressants developing an addiction. Not all people see a weight change once they start treatment with this medication, but those who do should talk to their doctor who could prescribe a different medication. Those for which a medication switch is not an option should be aware that exercise and eating well are an essential part of treatment. A diet rich in fruits, whole grains, protein, vegetables, and light dairy, not skipping meals and healthy snacks will help the patient avoid the weight gain on Lexapro. Some specialists believe that mixing Lexapro with small doses of seizure medication, certain stimulant drugs or low doses of naltrexone (used in the alcoholism and drug detoxification process) might help avoid packing on pounds. Still, this is to be done under the close supervision of a licensed physician. Any possible drug interaction will be discussed in advance. A registered dietitian can develop a diet plan that will fit the patient’s needs, just like a trained health professional can offer solutions to treat addiction to substances. The main point is to notice any weight change and address the doctor regarding any concerns.